The Mercedes-Benz Gel&auml;ndewagen has been with us for thirty years, and it has gone from military roots to plaything of the image conscious. First offered to the public in 1979, the G-Wagen has been continually refined over its run, and is still mostly hand-built. The details have changed, there have been two rounds of revisions, but the look has remained unmistakeable for the entirety of the model's run. A G-class has never been cheap, and it remains a pricey and utterly capable go-anywhere vehicle. Unfortunate, then, that many only see use as any old car would, never locking a differential. The GL-class was supposed to replace the Gel&auml;ndewagen, but it just ain't the same, so luckily, we get both. Carry on. Reminisce with the high-res gallery below and then check out the press release after the jump. 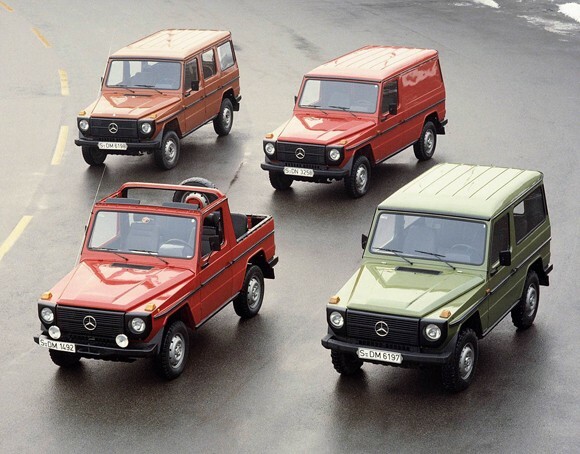 Mercedes-Benz GelÃ¤ndewagen celebrating 30 years originally appeared on Autoblog on Tue, 20 Jan 2009 12:29:00 EST. Please see our terms for use of feeds. I used to have one, I miss her and cringe at the knowladge that I know she's being utterly TRASHED on a daily basis. Unlike most I would lock the differentials about once a month to ensure they were in good working order. First time I did it I had to actually reverse in order to get the center diff to dissengage.